If you’re ready to start your own portfolio website, choosing a great theme is a very important step. Here is a list of our 10 best free WordPress portfolio themes. Providing a detailed description of each theme and it’s benefits, you should know the perfect theme for your website by the end of this article. Photolog is a very unique theme because of it’s “sticky” feature. The page is divided with one half reserved for a large image and the other half reserved for content. The “sticky” feature keeps the large photos in place while scrolling down the content half. Photolog gives you plenty of room to write about the story behind each photo. While scrolling down the photo and content halves alternate from left to right. You can also post smaller pictures in masonry layouts on the content half. Click on the demo link to view this awesome theme and see why it’s so unique. Business is our theme created specifically for small businesses and freelance photographers. Display your most impressive photos in a full-screen slideshow on the homepage. Add small columns of information on the homepage explaining your services and what you do. Also include some of your portfolios of work on the homepage giving visitors a great first look at your art. Make an awesome impression on visitors with this easily customizable theme. Shibui offers great features that make it surprising that it’s free. You can display a full-width slideshow on the homepage immediately giving visitors a look at your work. Directly below the slideshow you can add a welcome message enticing potential customers to look around your website. Showcase different sizes of photos in a masonry layout with infinite scroll, quickly loading more content when reaching the end of the page. Mixfolio allows you to create a minimal website that is easy to navigate. This theme was designed for artists to showcase their work on a clean and simple website. Mixfolio is perfect for creating galleries helping organize your work. Add a welcome message on the homepage telling visitors about your site. Display galleries on the homepage allowing visitors to quickly view your art. Mansion is a unique theme because it allows you to display a fullscreen grid of photos on the homepage. It includes a hover affect feature that brightens images when hovering over them. The menu is in the top left corner of the homepage, out of the way so you can fully view the massive grid of images. This theme is great for people who have many photos and want to display them in a unique way on their website. 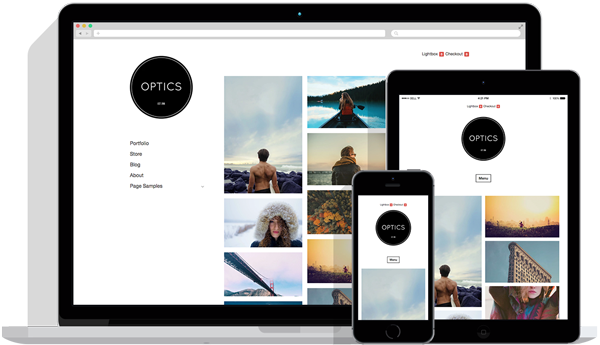 Optics is a minimal WordPress theme that is capable of powering portfolio, blog, and e-commerce websites. The homepage contains a left aligned menu with masonry layout options to display photos directly on your homepage. Build brand awareness by uploading your logo which is located in the top left right above the menu. Snaps, the free theme designed specifically for photographers who focus on portrait photography. Present a fullscreen header image on the homepage with a welcome message overlapping the photo. Snaps has a unique menu displayed on the bottom of the header image. Easily set-up and showcase portfolios on the homepage right below the header image. Fullscreen allows you to display a fullscreen grid layout of photos on the homepage. The hover features makes images brighter when hovering over them, making each image stand out. The menu is a horizontal menu located in the middle of the grid of photos. This theme is great for people with many photos to display on their homepage in a unique way. Sider is perfect for photographers who want to display their photos in a distinct layout. This theme allows you to showcase your work on a horizontally. Because of its simplicity, sider makes navigating through your website easy and enjoyable. Sider offers a unique design that us unlike any other theme. Onesie is one of our most successful themes. This theme gives you the most simple and affective website a photographer can ask for. Onesie is a responsive one page landing page. Perfect for quickly and easily showcasing your work without the navigation complications of a normal website, allowing you to cleanly display your work while immediately giving visitors what they are looking for.